I actually had already decided what novel I wished to ‘deconstruct’ when I put up my post earlier this afternoon. Not only that, I’d even started working on the deconstruction process. But for today’s blog post, I so wanted to use an excerpt from the novel I had chosen. Yet I didn’t think I should do that without first asking the author’s permission, (even though likely covered by the ‘fair use’ exception to copyright infringement). I didn’t expect to hear back from that author in time to write my blog post for today. At least not before the World Series started, which I know my husband wanted to watch. He’s on the ferry, he’s on his way home. He’s already phoned and asked me to record the game and order pizza. So, with that in mind, I decided I’d better get my blog post done before he arrived home. As you may have gathered from my earlier post, we take the World Series seriously in my house. (Or not, depending on who is playing). But that the answer to my email arrived, just as I posted. So for my ‘real’ blog post of the day, I’d like to thank our multi-talented, award-winning Canadian mystery author Ms. Louise Penny for granting me permission to reproduce the first paragraph of her first novel, Still Life. On her website, louisepenny.com, Ms. Penny reveals that when she was starting out, she was turned down more times than she cares to admit and so now shares advice with other writers on getting published. She knows what it is like to walk in our shoes, so to speak. Her debut novel, Still Life, winner of the New Blood Dagger, Arthur Ellis, Barry, Anthony, and Dilys awards, was repeatedly rejected. Don’t you want to read on? My heartfelt thanks to Ms. Penny for kind permission to excerpt her paragraph. This entry was posted in Writing by Paula Third. Bookmark the permalink. Great work reaching out to Louise Penny! 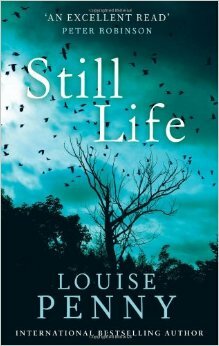 I really enjoyed “Still Life” — what a fantastic debut novel. Looking forward to sharing your deconstruction! Thanks Silk, a lesson to us all, she was back to me with permission within a couple of hours of receiving my request. Very professional and very encouraging. FYI, she’s on facebook too, but apparently not twitter. What about your Mr. Burke? So true, isn’t it Carol. We know to reach out and hook, but we seem to get carried away and go off n tangents nevertheless. But Ms Penny’s clear prose reminds us it doesn’t have to be complicated, we don’t need to allow ourselves to get side tracked. A great example of purposeful, spare, beautiful writing. Thanks again for following! In both the story I’ve written, and the one I hope to begin, the first person narrator is a young man, maybe late teens, into whom life crashes, and gets figured out later, only to inflict another crash. (They’re different characters in different unrelated stories, but really the same personality.) How do you get the reader hooked in a paragraph, or the first few pages, when you have such a narrator, whom I don’t think I can change because he’s me way back then? Aye, there’s the rub. I’ve been thinking a lot about how much we interject our own personas, (or what we perceive to be our own personas) into our protagonists – I may blog about that this week, – with the idea that maybe it is time to stretch our skills a little bit and try to change it up – write a protagonist that is not based on ‘us’ in some essence. I haven’t entirely decided on the next book I am going to write, (I’m getting a lot of ‘push’ from Silk to go with a half written, noir detective story set late 1930’s Honolulu, – the protagonist in that book will be male, one of a team of two detectives. Just haven’t decided on whether it should be the younger gentleman (Hapa Haole Hawaiian) (which is what I intended when I first wrote the story) or his perhaps more interesting superior, an ‘old school’ Chinese detective. Both very much outside my usual comfort zone for protagonists, – especially the cross-gender (author to protagonist) issues to deal with along the way.